If you are actively contributing to social media by producing video content, sooner or later streaming it to multiple platforms becomes a hassle. But you can’t narrow it down to just one channel since each of them is a unique source of the target audience. Uploading clips to each live streaming provider, one at a time, or using a ton of software and equipment for streaming to different media is not the best option either. Hence, you need a single tool that allows streaming to different destinations with the least amount of effort. That tool is a multi-streaming (simulcasting) software. If you want to find out how to easily multi stream on Twitch, Periscope, Facebook, and other services at the same time, then keep on reading. A multistream, sometimes called a dual stream, means you are transmitting one piece of video content to several social channels simultaneously. And using a multistream platform gives you a multitude of advantages. Every media holds a portion of your unique target audience. Favoring one over the other, you’re missing out on the views. But if you stream to multiple sites, you are more likely to be followed and viewed by more people. Multi-streaming platforms are great for collecting statistics about the entirety of your audience. For example, what’s your main source of views (which channel most of your audience comes from) or what phrases are most popular among your viewers. Trying to steer the audience from, say, UStream to Picarto might seem pushy. With multi-streaming software, you don’t need to persuade people to switch platforms to watch a video. You just reach out to all of them. It saves a great deal of time and effort if you can publish your content to all platforms simultaneously. You don’t need to download it from one place and upload to the other, it will be done automatically. Sounds quite good, right? Now, let’s discuss what you need to do take advantage of all these multistreaming benefits. Streaming hardware is a type of single-purpose encoders that have a CPU for processing and streaming video clips. All the appliances for recording audio and video content are connected to the hardware setup. Streaming software implies that you have a program, audio, and video sources all connected and running on a computer. Such software comes in a variety of prices and features but most of them can only hand a few streams without hindering the content quality (the more streams, the more traffic speed and CPU power you need). Cloud software is a type of multi-streaming service that doesn’t require a powerful computer since all the heavy lifting (video processing and traffic) is handled in a cloud. That makes it possible to stream high-quality content even with a 4G connection. Although multi-streaming hardware is lightweight, you should either keep it stationary or transport with caution. Software can be used from any place but the computer should be powerful enough to handle multiple streams. Cloud software, on the other hand, ticks all the boxes — it can be used from any place and any device. 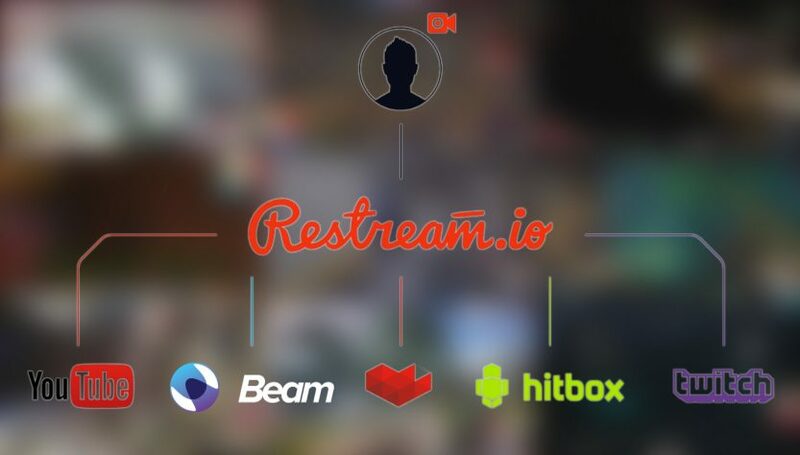 Restream is a robust cloud-based platform for multistreaming to a ton of different channels. It has all the necessary tools and features for influencers, streamers, and video creators to broadcast their content around the world. 30+ platforms. A single account on Restream allows you to multistream to YouTube, Facebook, YouNow, Twitch, Mixer, Steam, and lot more other platforms simultaneously. High quality. There are no processing or bandwidth limitations, and the video doesn’t lose quality while streaming. In addition, the platform has a really good editing tool to ensure maximum quality of streams. Simple and easy. An intuitive interface makes it easy to use all of the features to their fullest potential and save time on posting. Effortless. Online support and Help Center simplifies the learning curve. You can focus on engaging with your audience instead of the technicalities. Affordable. You can start with a forever-free plan or use professional features starting from only $16 per month. Aside from the basic features, Restream has other perks that make for a more speedy and productive multistream. These and other Restream tools and features will help you increase your production value thanks to the new level of live video distribution. And finally, let’s see how to broadcast live stream sessions using this software. How to livestream with Restream.io? Sign up with your email address and a secure password. Add сhannels using the button on the Dashboards menu. Connect streaming software and configure settings. If there are any more questions left, contact us via the Live Chat button or consult our Help Center.